Although the use of system routes facilitates traffic automatically for your deployment, there are cases in which you want to control the routing of packets through a virtual appliance. You can do so by creating user defined routes that specify the next hop for packets flowing to a specific subnet to go to your virtual appliance instead, and enabling IP forwarding for the VM running as the virtual appliance. For more information about UDR and IP forwarding, visit User Defined Routes and IP Forwarding. This article covers the classic deployment model. You can also control routing and use virtual appliances in the Resource Manager deployment model. 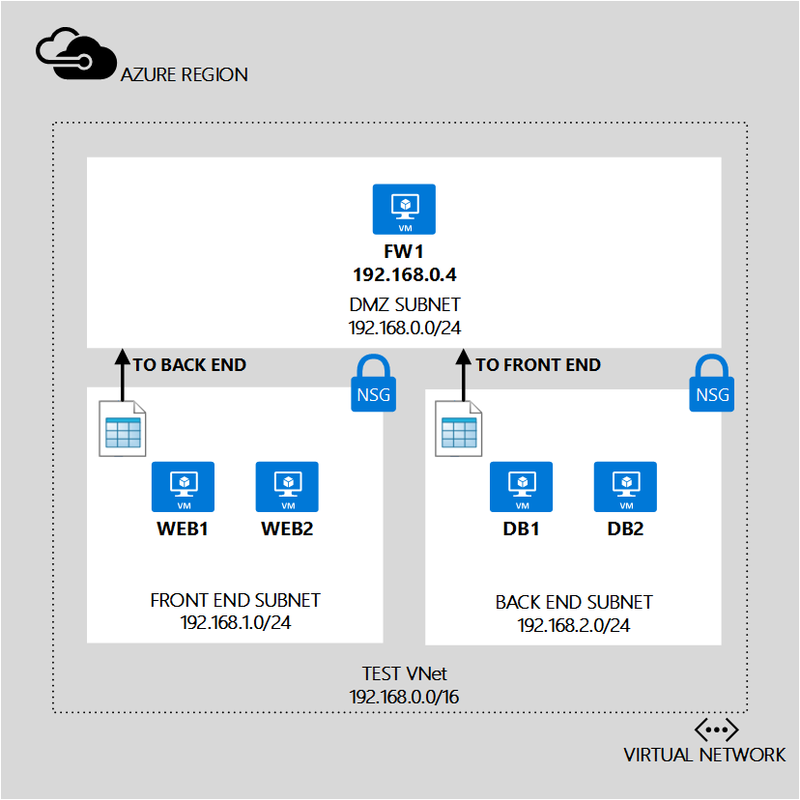 The combination of these routes ensures that all traffic destined from one subnet to another is routed to the FW1 virtual machine, which is being used as a virtual appliance. You also need to turn on IP forwarding for the FW1 VM, to ensure it can receive traffic destined to other VMs. The sample Azure CLI commands below expect a simple environment already created based on the scenario above. If you want to run the commands as they are displayed in this document, create the environment shown in create a VNet (classic) using the Azure CLI. To perform the steps in this article, you need to install the Azure Command-Line Interface for Mac, Linux, and Windows (Azure CLI) and you need to sign in to Azure. If you don't have an Azure account, you need one. Go sign up for a free trial here. In addition, to follow along completely you need to have either jq or some other JSON parsing tool or library installed. To create the route table and route needed for the front end subnet based on the scenario above, follow the steps below. info:    Creating route table "UDR-FrontEnd"
info:    Getting route table "UDR-FrontEnd"
-l (or --location). Azure region where the new NSG will be created. For our scenario, westus. -n (or --name). Name for the new NSG. For our scenario, NSG-FrontEnd. info:    Setting route "RouteToBackEnd" in a route table "UDR-FrontEnd"
-r (or --route-table-name). Name of the route table where the route will be added. For our scenario, UDR-FrontEnd. -a (or --address-prefix). Address prefix for the subnet where packets are destined to. For our scenario, 192.168.2.0/24. -t (or --next-hop-type). Type of object traffic will be sent to. Possible values are VirtualAppliance, VirtualNetworkGateway, VNETLocal, Internet, or None. -p (or --next-hop-ip-address). IP address for next hop. For our scenario, 192.168.0.4.
info:    Looking up the subnet "FrontEnd"
info:    Looking up network gateway route tables in virtual network "TestVNet" subnet "FrontEnd"
info:    Associating route table "UDR-FrontEnd" and subnet "FrontEnd"
-t (or --vnet-name). Name of the VNet where the subnet is located. For our scenario, TestVNet. -n (or --subnet-name. Name of the subnet the route table will be added to. For our scenario, FrontEnd.